1 What Is an Accumulator Bet? 1.1 With This Level of Risk, Why Place Accas at All? 3.2 System Betting vs. Accumulator Betting: Which Is Better? Accumulator sports betting, how to place accas, system betting, accumulator insurance and an online accumulator betting calculator. An accumulator bet (also known as an acca, a parlay bet, a multiple bet, and a combo bet), is the kind of bet that combines several selections at once, and if all of them win, the odds are multiplied together, but if at least one event loses, you lose the entire bet. Not bad, considering that we bet on favorites who are likely to win. However, there is a small catch here (which will be explained towards the end of the article). 1, 2, or all of the events lose. We lose $100. There is one more possible outcome when the event is cancelled (voided) which will also be explained further below. With This Level of Risk, Why Place Accas at All? Accumulator bets help increase your turnover. When you place a regular bet, your money is frozen, and you cannot use it for any other bet. With parlay, you can use one amount to bet on several events held at the same time. ($33 * 1.7) + ($33 * 1.3) + ($34 * 1.4) = $146.6 – which is two times less than what we would get with a multiple bet. To minimize the risks with your accas, you can insure them. All of the ways to do it will be covered further below. Do not bet on more than 2 or 3 events. It is true that the more events you select, the bigger your winnings will be, but, on the other hand, the probability of a loss also rises in geometric progression. The most common mistake newbies make is picking too many events with small odds. But why is that a mistake when all the events look like sure wins? Suppose, you place a 10-fold acca with 1.11 odds. The win probability is 90% for each individual event. By the law of averages, you lose 1 of 10 bets, which is obviously not a good thing when you place a combo bet. More information on win probability with accumulator betting will be presented below. Do not select matches based solely on their odds. Trivial and obvious as it may sound, you should first evaluate the statistics of the previous games and look at the official websites to learn about serious factors that may affect the team’s play, such as players’ injuries, insufficient motivation (for instance, when the main goals have already been reached and the first team will be replaced by a reserve team), etc. Accumulator bets are often compared to chain bets, but, unlike with the latter, the winnings with parlays are much higher (as the odds are multiplied together), while even one loss can lead to losing everything. The major downside to betting on several events is that even one wrong selection is enough to lose the entire bet. Those who are not ready for that degree of risk, may consider system betting which is an advanced version of accumulator betting. In system betting, you split your long acca into several shorter ones, so that losing one event would not lead to losing everything. This is how system betting is different from accumulator betting. The initial deposit amount is divided into several accas (3, in our case) and the eventual winnings are determined based on the number of wins. Suppose, you bet a total of 1,500 dollars. 1500/3 = 500 dollars for each acca. Now your profit will depend on how many of the selections win. Suppose, Selection №1 did not win. We then remove the accas that included it (№1 и №2) from our calculations. So, the only winning acca is Acca №3. It is not much, but then, if we used regular accumulator betting, our money would be entirely lost to bookmakers. In case all our selections win, the profit for each acca is calculated separately and the results are summed up. 500 * (3.06 + 3.33 + 3.15) = $4,770; 4,770 – 1,500 = $3,270 — net profit (For comparison, with regular accumulator betting, the earnings would be $8,492). Alas, in this case your entire system bet is lost. According to this variation of system betting, we pick 2 matches and place 3 twin accas betting on TU and TO. The matches we pick should be likely to demonstrate a slow game and a small number of goals. Important: The resulting multiplied odds must be more than 3. So, we earned profit from each outcome. Mind, however, that if the total number of goals in each of the matches were 3 or more, all the three accas would lose. System Betting vs. Accumulator Betting: Which Is Better? As they say, each to their own. With system betting, you get the maximum probability of a win and a small profit, while accumulator betting is riskier but allows for great winnings. Presented below is an accumulator betting calculator for system bets. When you decide on the system variation you prefer, enter the number of accas, the odds and the total bet amount, and calculate the results online. For detailed information, tap on the blue button at the bottom of the calculator. If you make system bets like 2/10, 2/3, 2/4, 3/4, 3/5, 3/6, 4/5, 4/6, 5/8, 5/10, 6/8, 7/8, 10/11, or any other ones that include up to 12 simultaneous events, the program will make the calculations. Methods and strategies of placing accas with minimal risks. Here is a simple insurance method found on the internet. Choose a match and place a regular bet on a favorite or a draw. Then place an accumulator bet where the first selection is the win of the underdog and the second is the win of the favorite in another match. We make a $100 bet on the win of Nashvillle Predators or the draw (with the odds of 1.14). Then we make a sort of an accumulator arbitrage bet where one acca includes the win of Dinamo and the win of another favorite in another match. Mind that the odds for the win of the favorite must not be lower than 1.8. An expected outcome — the win of Nashville Predators or the draw: 100 * 1.14 – 100 – 9.8 = $4.2 net profit. An unexpected outcome — the loss of Nashville Predators. Here our insurance comes into play and we get: 9.8 * 11.7 – 100 – 9.8 = $4.86 net profit. 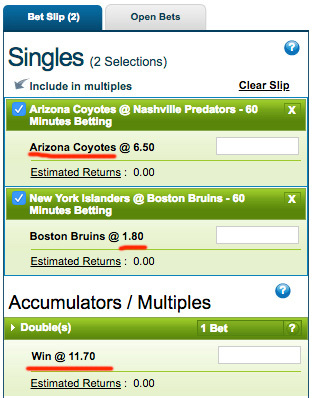 Everything seems to work great, as either outcome of the Nashville Predators – Arizona Coyotes match brings us profit. However, do not forget that the acca includes a second selection, and in case Nashville Predators loses and so does the second favorite, we will lose all the money. The strategy is based on odd/even betting, as the odds change in these lines is minimal. According to this method, we need to make a 6-fold accumulator bet on an even number of goals in all the matches. The events must not be simultaneous, but at least several hours apart. Then we place bets on opposite outcomes of each event in turn, i.e., if we bet on an odd number and the bet wins, our next bet is on an even number, and we continue like this until the single bets are all resolved. If all the 6 matches end with an even number of goals (which is unlikely), the accumulator bet wins, and our expenses are partially covered. 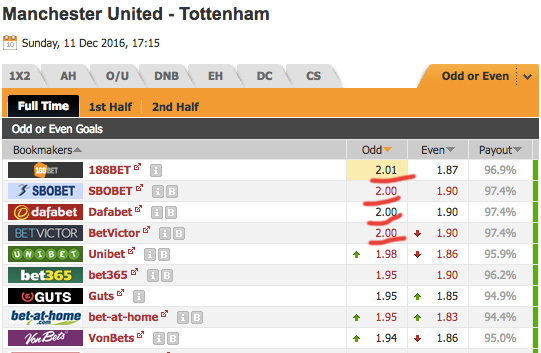 The screenshot below shows that some bookmakers offer odds of 2 for an even number of goals. Now we start betting on the opposite results — an odd number of goals (to maximize your winnings and not have problems with your bookmaker, it is better to place these bets with another bookie offering the highest odds). Suppose, the odds are 1.9. A lifehack: there is a way not to place our 6th opposite bet — then, in case of a “6th even in a row”, we earn $6,400 — $5,170 = $1,230 or -$5,170 if it is finally an odd number. If we pick 2 matches and select all the 36 possible outcomes, each will have big odds of around 50. This will generate excess profit that will by far cover the remaining losses. This strategy is suitable for those who prefer to bet with minimal risks. The idea behind anti-accumulator betting is to make at least one wrong selection. Simply put, you count on your acca to lose. The odds: 100/76 = 1.32 indicate the pure probability of the anti-acca to come in (bookmakers adjust the number downwards). This strategy is typically chosen by cautious bettors or newbies. The idea is to pick events with minimum odds — no bigger than 1.3. As a result, we have good odds for what seem to be 100% sure wins. However, in the long run, the strategy will leave you with a drained bankroll. A true-life story: An acquaintance of mine found what looked to him at the time a goldmine. He made an accumulator bet on matches in the European football championship predicting that top teams would not score themselves an own goal. Obviously, he counted on the players of the best national teams not making a childish mistake like that. Now imagine his disappointment when the English National Team, the pioneer of football, scored themselves an own goal and ruined all his hopes for “hitting the jackpot” (especially, as in all the other matches no own goals were scored). This strategy is not really accumulator betting, but more a tactic of betting on singles. According to it, we need to split the bank into several equal or slightly different parts. Example: The initial deposit of $1,000 is divided into $200+$300+$200+$300 parts. The bettor picks an event and makes the first bet of $200. If the bet wins, the whole amount (the bet + the net profit) is placed on the next event, and so on. In the reverse case, a new acca with a new bet amount comes into play. This technique allows you to single bet on several outcomes of one event in a way that excludes the probability of losing the entire bet amount under any circumstances. Mono accumulator betting is often used in basketball matches. Example: A bettor has 1,500 dollars. He divides the amount into 3 parts (1,500/3 = 500 dollars) and places bets. The outcome where all the 3 bets are lost is mathematically impossible. Explanation: odd + odd = even, odd + even = odd, even + odd=odd. So, the odd + odd = odd variant is mathematically incorrect. In case the 3 evens do not happen, we “chase” the money in the next quarter. The upside to using Martingale here is that we do not need to double the amount after every iteration. You can read about improved Martingale variations. In our example, at the next step, it will be enough to place $133 (instead of $200) on every bet to cover the loss and get return on investment. The upside to this strategy is that you can make judgements about the game, the level and the preparation of this or that team based on more than just the statistics. A true-life story: My friend used to bet on final matches of the group stage in the European Championship or World Cup. Typically, these matches are held at the same time and sometimes favorites who fight for the 1st place in the group may play with opponents for whom the match does not decide anything. By combining these events into one acca, you may increase your winnings. Since in tennis tournaments there are always many simultaneous games, it is the second popular sport for placing combo bets. For example, the two-week long Wimbledon tournament involves 128 men and the same number of women (and these are only the singles). There is a popular strategy, according to which, you bet live, with the first serve, on the favorite’s win in the first game. Generally, the odds here are not big, so accumulator betting may come in handy. By combining events like this you can get a good profit. While in case of a loss you can opt for chasing. Accumulator bets are the juiciest deals for bookies. So, you would not call these bets fool-proof. They make the lion’s share of bookmakers’ profit. Almost all bookies accept multiple bets. Some even offer bonuses, and some set a limit on the number of selections in your betting slip which is as much as three. If to speak about choosing a bookmaker to place accas in general, not mentioning any names, the usual rules will apply. Choose a reliable bookie with a long history and a big turnover. What sports can I place a combo bet on? Answer: On any sports. Tennis and football are the most popular ones. Can I place an acca on one match? Answer: No, bookmakers prohibit this. You have to include mutually independent matches. What happens if the match I included in a multiple bet is cancelled? Answer: If the event is cancelled, the bet will be settled on the remaining valid selections with the odds of 1. What if my parlay bet includes a handicap selection H1(0)? Answer: If the accumulator bet includes a whole-number handicap selection, and the stake is returned, it is refunded with the odds equal to 1. What happens if the match is postponed? Answer: The scenario varies from bookmaker to bookmaker. Anyway, circumstances like this should be specified in the rules. Most often, if the game is postponed for more than 1 day, the winnings are paid with the odds equal to 1. Speaking long-term, accumulator betting is hardly a way to go, which is confirmed by opinions on forums. The catch here is that by adding a new event to the acca, we decrease the probability of the positive outcome which is proportional to the probability of the new selection to win. This probability is reflected in the overall odds. No matter how 100% sure each independent event seems to you, the probability of all of them winning is inversely proportional to the number of added events. Read more about this in the article about value betting. In our example, the odds 3.094 show that the probability of winning the accumulator bet is: 100/3.094 = 32% (according to the probability theory, the odds are multiplied together). And that means that your chances to lose are 100-32 = 68%.